According to WNBC, NY, Yankee great Bobby Murcer has passed away at the age of 62, due to complications from brain cancer. Murcer, who was a broadcaster for the YES Network in recent years, was diagnosed with brain cancer in late 2006. 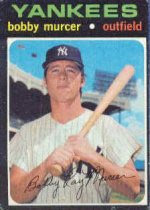 Murcer played for the Yankees from 1965-74 and 1979-83, was a 5 time All-Star. Condolences to his family and his friends. He will be sorely missed from my perspective due to his work on the broadcast booth, something he excelled at.